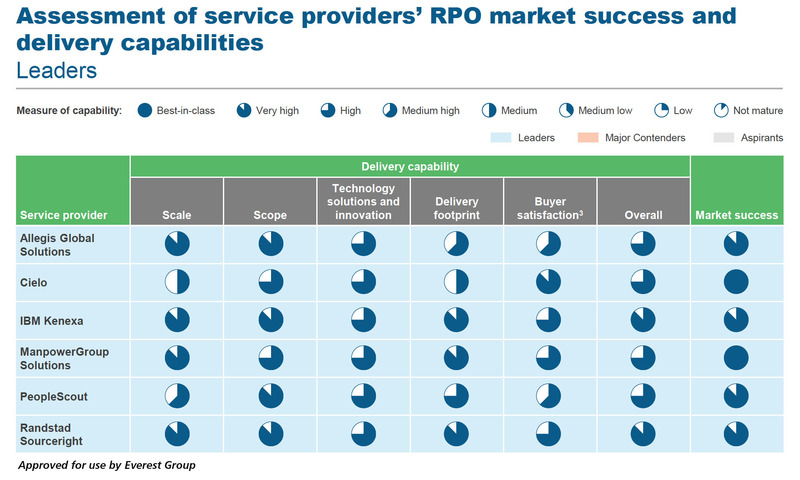 Home » Randstad Sourceright Insights » Randstad Sourceright receives top RPO capability positioning from Everest Group. 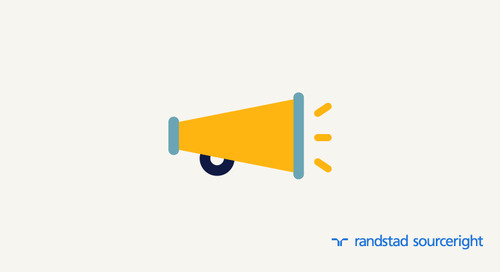 Randstad Sourceright receives top RPO capability positioning from Everest Group. Randstad Sourceright, a global talent solutions leader, remains one of the top Recruitment Process Outsourcing (RPO) service providers in the world, according to Everest Group’s 2016 RPO PEAK MatrixTM assessment. Among all vendors in the market, it was among the top three in service delivery capability. 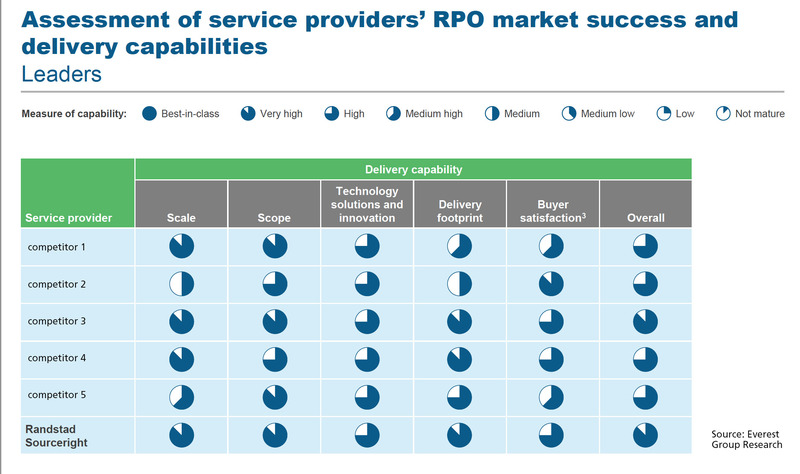 The report is the analyst firm’s most comprehensive study of RPO service providers and positions more than 20 companies based on their scale, scope, technology, innovation, delivery footprint and buyer satisfaction. Once again, Everest Group highlighted Randstad Sourceright’s exceptional delivery capability and market success, positioning it among an elite group of market leaders. Furthermore, Everest Group cited buyer accolades of Randstad Sourceright’s “flexibility and strong account management” as one of the reasons for its leadership. 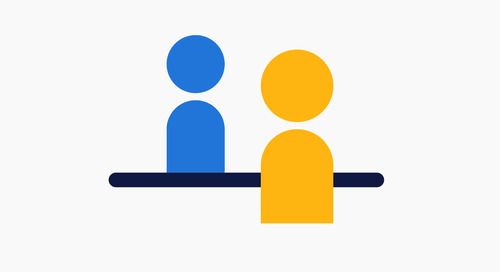 “Randstad Sourceright has demonstrated an ability to deliver an effective combination of process, technology and expertise to organizations in need of world-class recruitment practices. Furthermore, its extensive capabilities in managing contingent talent positions the company to deliver compelling blended recruitment solutions,” said Rajesh Ranjan, partner and head, Business Process Services Research, Everest Group. Everest Group also cited Randstad Sourceright’s recent enhancement in service capabilities. The acquisition of the twago freelance management system enables the company to offer clients a complete range of talent management services encompassing all types of contingent and permanent workers. Last year, the TalentRadar analytics platform was launched to support intelligent talent decisions. “In these tough times of talent scarcity, organizations need a complete turnkey solution to keep their businesses growing. We’re excited to have Everest Group once again recognize how effective and comprehensive our RPO and integrated talent solutions are to talent acquisition success. Our clients would be assured to know that as a perennial leader in the market, we continually invest in and enhance our capabilities to bring cutting-edge technology and practices to their companies in all parts of the world,” said Rebecca Henderson, Group President, Randstad Sourceright. Click here to learn more about the PEAK Assessment report.